We can’t help but clamor for Georgian cuisine, and we’re not the only ones. Once you taste those flavors, they’re impossible to forget. Traditional Georgian food is perfumed with lavish spices and herbs. The country sits on the fabled Silk Road that bridged Asia and Europe. That’s why traditional Georgian food evokes outside influences like Shanghai soup dumplings, Persian braised meats, and golden slippers of Indian flatbread. You might not be able to fly to Georgia, but you can definitely get a catering spread of traditional Georgian food delivered to your office. Here are 14 Georgian dishes you should try. 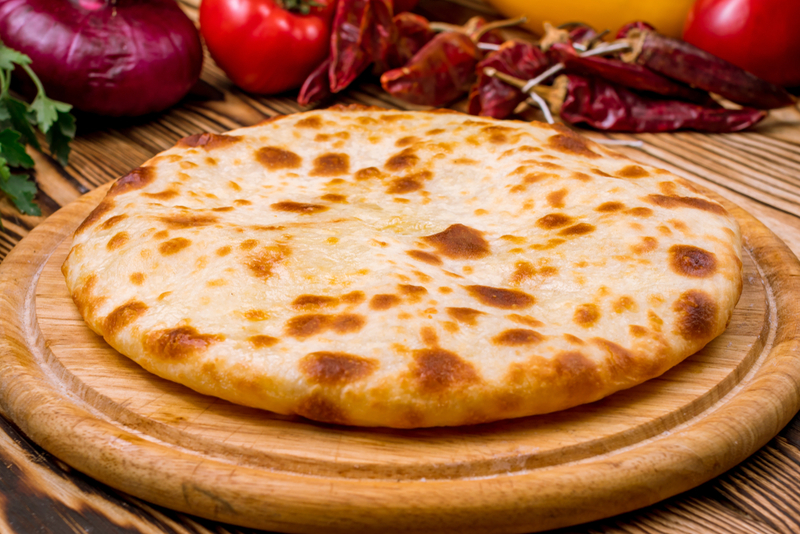 This is one of the finest flatbreads you’ll ever encounter. It’s also one of the most famous breads of Georgian cuisine. 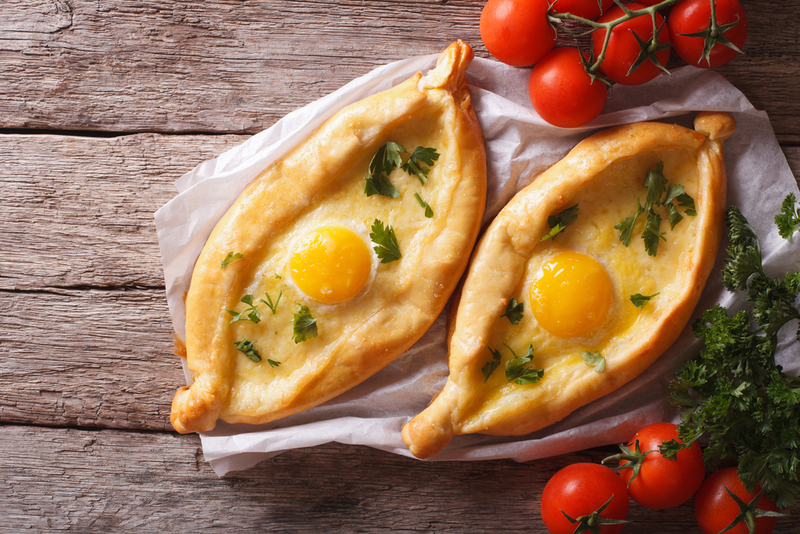 Shaped like a boat, the bread is filled with near-volcanic cheese and topped with a runny egg and a knob of butter. Churn the golden, bubbling cheese with a fork, then pull chunks off the vessel and dip. The restaurant Jana Grill and Bakery caters this utterly addictive flatbread and other traditional Georgian foods. This warm, griddled flatbread is made with yogurt for an absolutely tender chew. Plus, it’s filled with soft, savory cheese. Similar to the imeruli, this savory flatbread is showered with more cheese and baked for a golden-brown bubbly crust. The restaurants TK House of Breads and Toné Café offer many of Georgia’s legendary breads and pastries stuffed with herbs, vegetables, cheeses, and meats. These festive bites go fast, whether you use them as appetizers or as a side dish. Slices of salty, elastic cheese, called sulguni, are filled with soft cottage cheese and herbs and folded beautifully into cones. This cold vegetable pâté can be served as a dip, a spread, or an appetizer. A mixture of finely chopped greens is mixed with a garlicky walnut-and-herb paste and formed into spheres. The bite-sized starters are sprinkled with pomegranate seeds. The richness of fried eggplant slices gets even better with a garlicky walnut paste. These one-bite vegetarian wonders go fast. Find this and other traditional Georgian foods at the restaurant Jana Grill and Bakery. There’s nothing like a hearty bowl of lobio stew to warm up the team on a chilly day. Here, the humble ingredients create a deeply satisfying meal. The tomatoes add the depth of umami. The potatoes add texture. And a special variety of beans is mashed with pungent, raw garlic and a mountain herb called blue fenugreek to deliver creaminess. If you love creamy, perfectly cooked polenta, you’ll love elarji, made with cornmeal and a hefty handful of cheese. 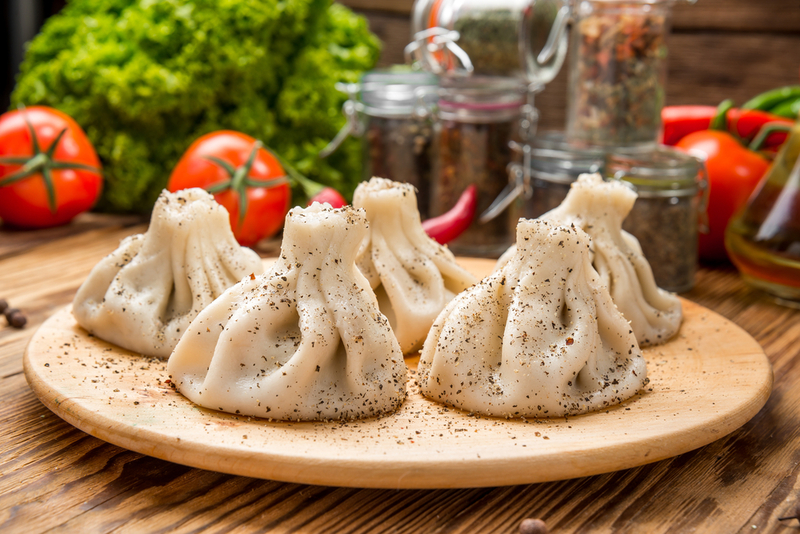 These monumental dumplings are one of the most iconic dishes of Georgian cuisine. Shaped like money bags, these juicy soup dumplings are stuffed with beef and lamb. Georgians pick up the parcels by the topknots and snip off a corner, slurp the broth, and eat everything but the dough knot, which is discarded. When your team deserves a soothing bowl of chicken soup, go for a big order of this. The rich, ramen-like broth is rejuvenating, made with chicken, eggs, lime, mint. You’ll find this soup and other foods of Georgian cuisine at the restaurant Toné Café. This delicate and robust vegetable stew is layered with the flavors of eggplant, tomato, bell pepper, and herbs. Scallion, wine, and heaps of tarragon are thrown into the lamb stew, which simmers for hours. Pair this with a spoonful of Georgian plum sauce, which maximizes the flavor. Think of this as a power sauce to punch up the flavor of the rich, braised meats of Georgian cuisine. The sour plum sauce is made with chopped up green and red varieties of plums to deliver a pungent, tart kick. A dollop of sauce makes tender braises and sizzling kabobs even more fantastic. 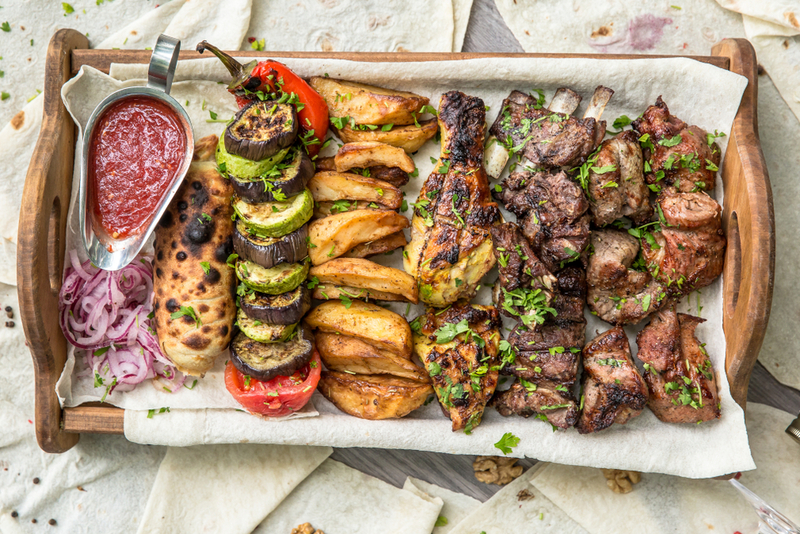 Get into summer already with these glorious skewers of grilled meats. The juicy kabobs are made from well-marbled meats tossed with aromatics, spices, and tart pomegranate juice. In Georgia, the skewers are often grilled over the embers of grape vines so the crispy hunks of meat pick up the aromatic smoke and seal in their juices. The restaurants TK House of Breads and MO Shaurma will spoil your crew with their spiced kabobs. Eat amazing Georgian food at your next company event.